In Once Upon a Time, players tell a story together using cards that show fairytale elements and endings. Now add more valorous deeds to your game with the Knightly Tales expansion. 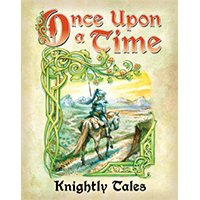 Inspired by legends of gallant knights and their ladies, the 38 Story Cards and 17 Ending Cards in this set can be shuffled into your Once Upon a Time storytelling card game deck to add chivalrous themes and more variety to your game. For an even stronger knightly feel, try removing some of the core Story or Ending Cards.